Our memories are one of our primary channels for knowledge, but much of what we "remember" is actually false memories or confabulations. Where does that leave us? The above questions merely scratch the surface of "epistemology", the philosophical term for our inquiry into knowledge: what it is, the ways we acquire it, and how we justify our beliefs as knowledge. 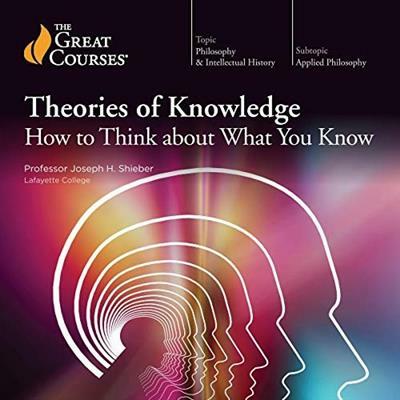 Delve into this exciting field in Theories of Knowledge: How to Think About What You Know. Taught by acclaimed Professor Joseph H. Shieber of Lafayette College, these 24 mind-bending lectures take you from ancient philosophers to contemporary neurobiologists, and from wide-ranging social networks to the deepest recesses of your own brain. Epistemology is as old as philosophy itself. Your survey takes you back to Plato, who defined knowledge in terms of "true belief" - a personal belief that corresponds with some external truth. You'll see how this relationship between knowledge, belief, and the truth aligns with what 20th-century developmental psychologists have learned about children and the way we first begin to access information.